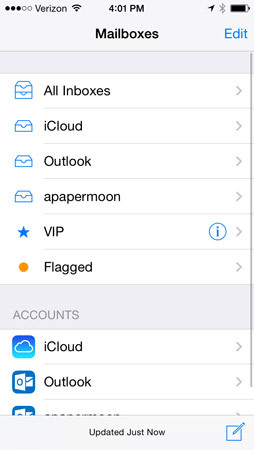 Once you have your mail synced on your iPhone, it is easy to open and read your messages. You should see the Mail app icon on your Home screen. Just follow these steps. Tap the Mail app icon, located in the Dock on the Home screen. A red circle on the icon, called a badge, indicates the number of unread emails in your Inbox. 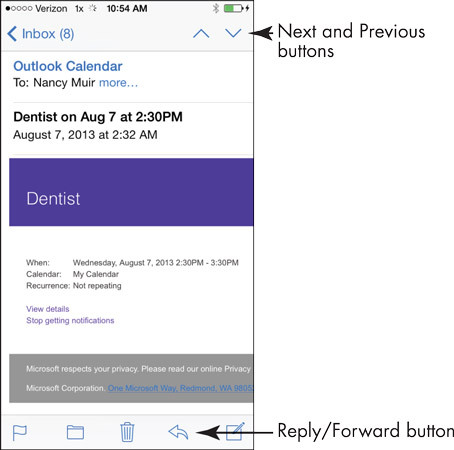 In the Mail app, tap the Inbox whose contents you want to display. Tap a message to read it. It opens. If you need to scroll to see the entire message, just place your finger on the screen and flick upward to scroll down. You can swipe right while reading a message to open the Inbox’s list of messages, and then swipe right again to return to your list of mailboxes. The new 3D Touch feature allows you to preview an email before you open it. Simply press lightly to select the message, press with medium pressure to preview it, and press a bit harder to open the message. You can tap the Next or Previous buttons (top-right corner of the message) to move to the next or previous message in the Inbox or tap All Inboxes in the top-left corner to return to your Inbox. Email messages that you haven’t read are marked with a blue circle in your Inbox. After you read a message, the blue circle disappears. You can mark a read message as unread to help remind you to read it again later. With the inbox displayed, swipe to the right (starting your swipe just a little in from the edge of the screen) and a message and then tap Mark as Unread. 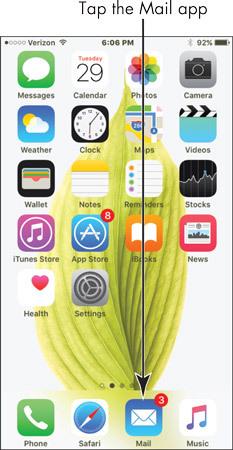 If you have an iPhone 6s or 6s Plus and you hold it horizontally, you will view both the Inbox and currently selected message. This is because the larger 5.5” screen can accommodate more content, and apps such as Mail and Weather take advantage of this.